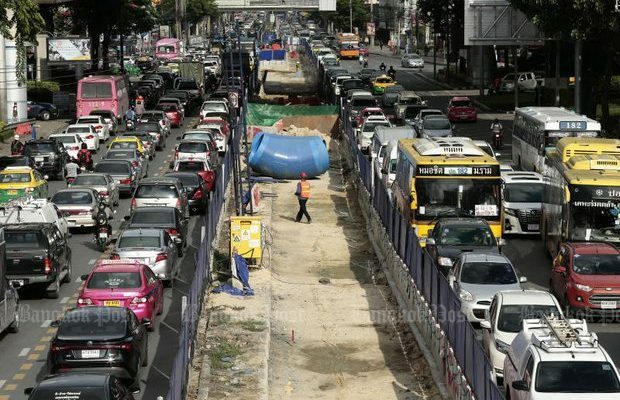 Commuters who rely on Lat Phrao Road in Bangkok are set for three more years of even heavier congestion as police ramp up traffic diversions from Wednesday to make way for construction of the Mass Rapid Transit Authority of Thailand’s (MRTA) Yellow Line monorail. The diverted traffic is likely to worsen tailbacks on a street notorious for its traffic jams. It will affect a 9km stretch and deputy project manager Kitti Akewanlop said yesterday it could take three years to complete. As a result, instead of three lanes running in either direction, motorists will have to make do with two or one. 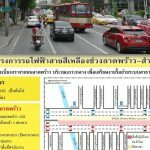 Meanwhile, starting Wednesday, central road barriers that provide left or right turns into adjacent streets will be closed from Lat Phrao sois 61 to 87 until the construction work has been finished, meaning longer waits for U-turns. All such openings running along a 9km stretch from Bang Kapi to Chokechai Si will be closed by Aug 20 so pillars for the electric train line can be embedded in the central island, officials said. etropolitan Police Bureau deputy commissioner Chiraphat Bhumichitr said commuters would have to enter the start or end of Lat Phrao Road and take U-turns instead. “During this period we recommend people avoid using Lat Phrao Road whenever possible,” he said. 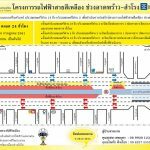 Pol Maj Gen Chiraphat said the Traffic Police Division has instructed the MRTA and the contractor of the Yellow Line to install more signs informing commuters about shortcuts in the area. Most of the suggestions involve avoiding the main road and using smaller streets or surrounding roads instead like Nawamin, Prasert-Manukitch, Phahon Yothin and Ratchadaphisek roads. According to traffic police reports, Lat Phrao Road handles more than 4,000 vehicles per hour. Several city buses under the Bangkok Mass Transit Authority of Thailand (BMTA) also use this route including the No.8, making it one of the most popular routes in Bangkok. “We will have to hold talks with the BMTA on where the buses will stop on the road during the construction of the Yellow Line to minimise congestion,” Pol Maj Gen Chiraphat said. Construction of the feeder-system-style monorail, which stretches 30km from Lat Phrao to Samrong, began late last month. Yet the effect on commuters was not fully felt until Wednesday. Upon completion the 23-station network will start from the Ratchada-Lat Phrao intersection and will share stations with the MRT Blue Line at Lat Phrao station. It will then run along Lat Phrao Road until it reaches the Bang Kapi intersection, located near The Mall Bang Kapi. Finally it makes a left into Theparak Road in Samut Prakan where it terminates at Samrong but can link to the BTS Green Line’s station of the same name. 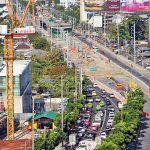 Traffic in Lat Phrao has been made worse due to the ongoing construction of the Orange Line’s eastern route from the Thailand Cultural Centre to Min Buri, which began earlier this year. When finished in2023 it will run from Taling Chan to Min Buri. The Yellow Line, along with its sister project, the Pink Line monorail from Khae Rai (in Nonthaburi) to Min Buri, will be the first monorail networks in Thailand when they are finished. The Bangkok Mass Transit System Plc, which operates the BTS Green Line, is set to operate the routes. A joint consortium also comprising Sino-Thai Engineering and Construction Plc and Ratchaburi Electricity Generating Holding Plc won the bids for both routes back in December 2016. Road diversions for the Pink Line already started in November. The 34.5km route is worth 53.5 billion baht. 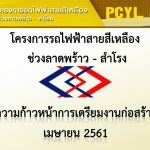 The 30km Yellow Line is valued at around 51.9 billion baht.